Regis Prograis: I’ll knockout Jose Ramirez! By Jeff Aranow: Regis Prograis says he’s going to knockout WBC light welterweight champion Jose Ramirez when the two of them face each other in the near future. The unbeaten Prograis (22-0, 19 KOs) says he hits harder than Ramirez, and he has a better skill-set than him. A fight between Prograis and the unbeaten Ramirez (23-0, 16 KOs) could potentially take place in 2021 after Regis finishes with the World Boxing Super Series light welterweight tournament he’s taking part in. Prograis will be facing former WBO lightweight champion Terry Flanagan (33-1, 13 KOs) this month in the quarterfinals of the WBSS 140 lb tournament on October 27 at the Lakefront Arena in New Orleans. Prograis, 29, is expected to win that fight without any problems. Prograis’ toughest fight in the WBSS tournament figures to be unbeaten Josh Taylor (13-0, 11 KOs), who is facing Ryan Martin (22-0, 12 KOs) on November 3 at the SSE Arena in Glasgow, Scotland. WBA ‘regular’ light welterweight champion Kiryl Relikh defeated former IBF champion Eduard Troyanovsky in his quarter finals fight. Anthony Yigit will be facing Ivan Baranchyk on the undercard of Prograis vs. Flanagan. “The only thing I can say is he can’t beat me,” Prograis said to Figthhype about Jose Ramirez. “He’s a great good fighter, but I think I’m on a different level, because of my skill-set. I know he has power, but I’m pretty sure I hit harder than him, and he gets hit by a lot of punches. He’s open, and for someone like me, I really think I can stop him. If I don’t stop him, I think the referee is going to stop him. I can’t see him beating me. I don’t think he can beat me. He’s good, and his fight against [Antonio] Orozco was an exciting fight for boxing. I think I would have knocked both of them out. After the third round, he had Orozco hurt. He let him survive. With me, that wouldn’t have happened. That fight would have been over. It definitely would have been over. That’s the only thing I can say about him. I’m making history. When I fight in New Orleans, it’s an event,” Prograis said. Ramirez’s promoters at Top Rank will likely take their time before making the fight against Prograis. They want to build it up before it takes place. Prograis could have fought Ramirez for the WBC title, but his schedule conflicted due to him entering the WBSS tournament. Things would have been much easier if Ramirez had taken part in the WBSS tournament, as it would have increased the chances of him and Prograis meeting up at some point. For now, Prograis needs to get through the WBSS tourney for him to stay on course for a fight between him and Ramirez. Ramirez won the vacant World Boxing Council light welterweight title in beating Amir Imam by a 12 round unanimous decision last March. In Ramirez’s first defense, he beat previously unbeaten Antonio Orozco by a 12 round unanimous decision on September 14 in an impressive performance. The guy that could potentially give Prograis the most problems is Josh Taylor. He’s looking very hard to beat right now. Prograis will be accomplishing a lot if he can get to the WBSS final to beat Taylor in 2019, which is when the two of them are expected to face each other. 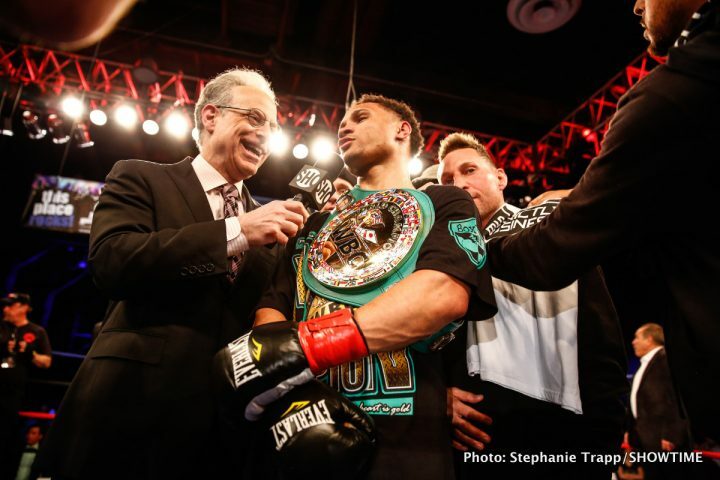 Boxing » News » Regis Prograis: I’ll knockout Jose Ramirez!